Day 1 is done and over with at least officially. There is some sort of techno dance party happening outside our hotel that I think will make it impossible to sleep, which I'm not looking forward to, but whatever. Today was a pretty calm day. There weren't a lot of big huge panels (at least not unless you're a Twilight fan), so we got into everything we wanted to, picked up some cool swag along the way and even had time to have a real sit-down meal. Today's haul: not as big as preview night, but so much awesome. 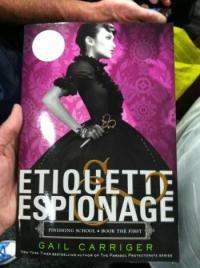 I luckily got the super secret Gail Carriger swag, which turned out to be an advanced copy of the first book in her upcoming YA series, Etiquette & Espionage. My squeal of delight amused the guy from Orbit/Hachette immensely. Other highlights was a signing of Eve & Adam by Michael Grant & Katherine Applegate and ARC giveaways of Falling Kingdoms by Morgan Rhodes. I also learned a piece of information that, if I'm super lucky on Saturday, will make this the best con ever. As far as panels went, I started off the day with the ladies of Steampunk, quite possibly the most fashionable panel of the Con. It's also probably the only panel where the panelists will be drinking tea out of tiny little porcelian cups and eating mini scones. The conversation quickly evolved into a discussion of the importance of wearing a properly fitted corset and how much research goes into the writings of such authors as Gail Carriger, Kaja Foglio (Girl Genius), and Anina Bennett (Boilerplate). The fact that the conversation was equal parts about fashion and the awesomeness of science just reinforced why I love steampunk so much. Fernando and I also attended the screening of Beauty & the Beast, though we got in about 15 minutes into it. From what we saw, I can confidentally say that there is no way I'm going to sit through that entire pilot again. It is cheese all the way through with forced insta-love and the silliest "beast" I've ever seen. It's unfortunate because I like the idea of the "beast" being created by a scientific super soldier experiment, but man, was the cheese excessive. Then came Elementary, CBS's modern take on Sherlock Holmes with Eli Stone Jonny Lee Miller and Lucy Liu. We'll have a full pilot review of this one later on, but in short, it is by far definitely not Sherlock. And the gender swap of Watson seemed a little forced to serve the plot rather than feeling like a natural fit to the type of story being told. The panel afterward more or less said it was so they could have sexual tension somewhere down the line. I'm on the fence on this one. I wandered into a panel about comic book podcasters, moderated by Josh Flannagan of iFanboy, I occasionally catch becaus Fernando listens to it. It was really interesting to hear these popular podcasters discuss whether or not what they do should be considered journalism, what makes for proper critiquing and whether or not to include negative reviews in their shows. It was also pretty fun. Then came Simon & Schusters' panel about upcoming titles. Unlike last year, there weren't really any surprises (at least to me). The Clockwork Princess cover was "revealed" though technically it was revealed yesterday via Twitter. Otherwise it was just a glorified raffle for stacks of books. Unfortunately I did not win Scott Westerfeld's entire back catalog, which makes me kind of sad, Fernando pretty happy and my suitcase a little less likely to be overweight on the return flight home. After Day 1 was done at the convention center, Fernando and I chased Bat signals around town along with several other people. Somehow that turned into a last second trip two miles away to claim a Mondo special edition The Dark Knight Rises poster. Earlier Fernando also got a special edition Game of Thrones poster (pics forthcoming), so all in all, I'd say it was a good day. And that's not taking into account that Seth Green nearly ran into me in the exhibit hall because he was filming something on his camera phone. Somehow us running into or nearly running into Seth Green has become an annual event. That dude is everywhere. Now I am sleepy, so return tomorrow for more updates.